The Appearance of the Icon of the MostHoly Mother of God in the City of Kazan (1579): On 1 October 1552, on the feastday of the Pokrov-Protection of the MostHoly Mother of God, at night, tsar Ivan IV in heading the Russian forces made ready for a decisive assault against the Tatar city of Kazan, and suddenly he heard the peeling of the Moscow bells. The tsar realised that this was a sign of the mercy of God: that through the prayers of the mighty commander-in-chief, the Lord deigned that the Kazan people should be converted to Him. The surrender of Kazan on the feast of the Pokrov-Protection of the MostHoly Mother of God completed a course of events, initiated way back centuries earlier in the year 1164 by holy Prince Andrei Bogoliubsky (+ 1174, Comm. 4 July), against the Moslem Volga Bulgars. With the taking of Kazan, the Volga – the chief waterway route of the land, became finally a Russian river. And from Tatar servitude were liberated 60,000 Russian people. The enlightenment of the Tatars with the light of the Gospel truth was started. There were the first martyrs – Saints Peter and Stephen (Comm. 24 March). The newly established Kazan diocese entered into the complexion of the Russian Church and was soon illustrious in its own archbishops: Sainted Gurii (+ 1563, Comm. 5 December) and Sainted German (+ 1567, Comm. 6 November). But the advance of Orthodoxy was especially enabled amongst the Volga Mahometans by the appearance, on 8 July 1579, of the wonderworking Icon of the Mother of God in the city of Kazan. Preaching the Gospel had been a difficult matter in this conquered kingdom amongst the incorrigible Moslems and pagans. The MostHoly Mother of God, Mediatrix of preachers of the Word of God, Who even during Her earthly life shared in the evangelic work of the holy Apostles, – in looking down upon the efforts of the Russian missionaries, She did not hesitate to send them Heavenly help, manifest through Her wonderworking Icon. On 28 June 1579 there occurred a terrible conflagration which had started around the church of Sainted Nikolai of Tula. This fire destroyed part of the city and turned to ashes half of the Kazan Kremlin. The adherents of Mahomet gloated, supposing, that God had become angered against the Christians. "The faith of Christ, – says the chronicler, – is rendered a fable and an outrage". But the conflagration at Kazan was the foreboding of the ultimate fall of Islam and affirmation of Orthodoxy throughout all the land of the Golden Horde, the future East portion of the Russian realm. The city began quickly to rise up from its ruins. Together with others who had been burned out, and not far from where the conflagration had started, – was built the house of the musketeer Daniil Onuchin. The Mother of God appeared in a dream to his nine year old daughter Matrona and commanded her to find Her icon, hidden in the ground by secret confessors of Orthodoxy way back still in the time of Moslem rule. But to the words of a mere girl they paid no attention. Thrice the Mother of God appeared and pointed out the spot, where the wonderworking icon had been concealed. Finally, Matrona with her mother began to dig in the indicated place and they found the sacred icon. To this place of the miraculous discovery there came archbishop Jeremii at the head of his clergy and transported the holy image into a church of Saint Nicholas situated nearby. From there, after a molieben, amidst a church procession they transferred it to the Annunciation cathedral – the first Orthodox temple in the city of Kazan, erected by tsar Ivan the Terrible. During the time of the procession there occurred the healing of two blind men – Iosif and Nikita. A copy of the Icon, which had appeared at Kazan, together with an account of the circumstances of its discovery and descriptions of the miracles was dispatched in 1579 to Moscow. Tsar Ivan the Terrible gave orders to build at the place of its appearance a temple in honour of the Kazan Icon of the Mother of God, to install therein the holy icon, and to found there also a women's monastery. Matrona and her mother, instrumental in finding the sacred icon, accepted monastic tonsure at this monastery. At the Nikol'sk (Nicholas) church, where the first molieben had been made before the Kazan Icon, was serving at this time as priest the future Sainted Ermogen, Patriarch of Moscow (+ 1612, Comm. 17 February). Fifteen years later, in 1594, now as Metropolitan of Kazan, he compiled a report of the holy events to which he had been an eyewitness and participant: "Account and Miracles of the MostPure Mother of God from Her Venerable and Gloriously Manifest Image at Kazan". In this account are descriptions with great factual precision regarding many an instance of healing, from the wonderworking Icon through the prayers of believers. The "Account" manuscript – written by His Holiness Patriarch Ermogen – was in its entirety reproduced in facsimile edition: "Report about the Wonderworking Kazan Icon of the MostHoly Mother of God", with an introduction by A. I. Sobolevsky, M(oscow) 1912. The not-large Icon, discovered by the girl Matrona in the then recently annexed foreign frontier of the Russian realm, soon became a national sacred item, a sign of the Heavenly protection of the Mother of God, manifest for all the Russian Church, since the soul of the Orthodox nation sensed the special participation of the All-Pure Lady Mother of God in the historical destiny of its "Rodina" native-land. Not by mere chance was the Kazan Image a copy of the ancient Blakhernae Icon (Comm. 7 July) written by the holy Evangelist Luke, and considered in its iconographic type to be of icons named "Hodegetria" ("Putevoditel'nitsa", "Way-Guide"). Many a time the "Kazan Mother" showed the way to victory for Russian Orthodox soldiers in the fulfilling of their sacred duty for God and Country. In the year of its appearance at Kazan (in other sources two years afterwards) there began the remarkable onward march "Beyond Kazan" (beyond the Ural Mountains) envisioned by Blessed German (+ 1567, Comm. 6 November), and taken by the Cossack ataman Ermak Timofeevich Povol'sky (+ 1584), an effort crowned finally with the annexation of Siberia. With a graced energy and coursing about in miraculous manner it proved sufficient, that for some several decades Russian explorer-missionaries should proceed to the East, " to meet the sun", going many thousands of kilometers. On the feastday of the Pokrov (Protection, 1 October) in 1639 they sailed out on their first voyage along the Pacific Ocean, preaching salvation to the surrounding peoples. Orthodox soldiers and missionaries went east, while apostates fled to the West. Jesuits seemingly attempted to drown Rus' at the beginning XVII Century with tumultuous waves of sovereign-imposters and "rapacious people". It was indeed through Divine Providence, during the period of the Polish Occupation (1605-1612), which the nation termed the "Time of Troubles", that the Russian Church was headed by a great confessor of Orthodoxy – the PriestMartyr Ermogen, Patriarch of Moscow and All Rus', who had been among those first to venerate the Kazan Icon of the MostHoly Mother of God, becoming the author of the "Account" about it and the Service to it. During the difficult days when Moscow was occupied by the Polish, and discord and disorder having spread throughout all the land, this resolute sufferer for the Holy Faith and Fatherland was held under guard, and he managed secretly to send off to Nizhni Novgorod an appeal: "Write to Kazan to metropolitan Emphrem, and let there be sent a document of direction to the regiments for the boyars and to the Cossack forces, that they should rise up in force for the faith, put an end to the plundering and preserve brotherhood, and should vow to pledge their souls for the house of the All-Pure and the wonderworkers and for the faith, let there be done. And in every city... write thus in my name". The Nizhni Novgorod people responded to the appeal of the archpastor. Prince Dimitrii Mikhailovich Pozharsky headed the gathered militia. The Kazan forces, joining in with the militia, brought with them a copy of the wonderworking Kazan Icon, which they gave to prince Dimitrii at Yaroslavl'. The MostHoly Lady Mother of God took the militia under Her protection, and by Her intercession Russia was saved. The Russian forces experienced tremendous difficulties: inward hostilities, and insufficient armament and supplies. In the bad weather of Autumn the Russian army moved on to storm Moscow, situated in the hands of the Polish. A three day fast and fervent prayer before the Kazan Icon of the Mother of God inclined the Lord to mercy. Within the besieged Kremlin at this time was held captive the Hellas Archbishop Arsenios (Arsenii, afterwards Suzdal' archbishop, + 1626, 13 April), who had arrived from Greece and was grievously ill from his journeying and being shaken about. By night the cell of Sainted Arsenii was suddenly lit up by a Divine light, and he beheld the Monk Sergei of Radonezh (Comm. 5 July and 25 September), who said: "Arsenii, our prayers are heard; through the intercession of the Mother of God the Divine judgement of the Fatherland is changed to mercy; on the morrow Moscow wilt be in the hands of its besiegers and Russia saved". As though in proof of the veracity of this prophecy, the archbishop received healing from his sickness, and then this joyful occurrence became known to the Russian forces. On the following day, 22 October 1612, Russian forces, inspired by the vision, seized a sweeping victory and took the Chinese-quarter, and 2 days later – the Kremlin itself. On Sunday, 25 October, Russian forces triumphantly in church procession made entry into the Kremlin, bearing the Kazan Icon. At the Skull-Place ("Lobnoe mesto", i.e. the public execution spot), the church procession was met by Archbishop Arsenii emerging from the Kremlin, bearing the Vladimir Icon of the Mother of God, saved by him in his captivity. Moved by the effect of the meeting of the two wonderworkings icons of the Mother of God, the people with tears made prayer to the Heavenly Mediatrix. With the expulsion of the Polish from Moscow, – according to the Nikonov chronicle, prince Dimitrii Pozharsky had the holy Kazan Icon placed in his own parish church of the Entry in the Temple of the MostHoly Mother of God, at Lubyanka in Moscow. Afterwards, at the expense of the prince-patriot, there was erected the Kazan cathedral on Red Square. The holy icon, which had been with the armies of Pozharsky during the liberation of Moscow, was transferred in 1636 into the newly constructed temple, the Kazan cathedral. At present, this holy image is situated in the Patriarch's Theophany cathedral in Moscow. In commemoration of the liberation of Moscow from the Polish, a special feastday in honour of the Kazan Icon of the Mother of God was established under 22 October. At first this celebration was made only at Moscow, but from 1649 it became an all-Russian celebration. In 1709, before the Poltava Battle, Peter the Great prayed with his soldiery in front an icon of the Kazan Mother of God (that from the village of Kaplunovka). 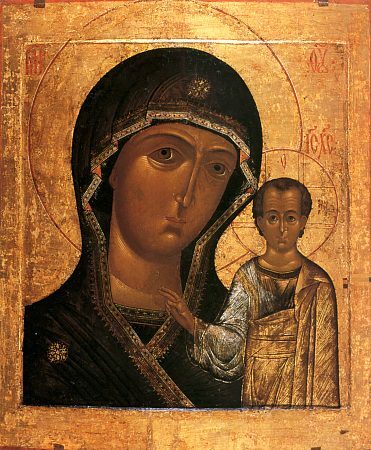 In 1721 Peter transferred one of the copies of the Kazan Icon of the Mother of God from Moscow to Peterburg, where at first the icon was placed in a chapel, then at the Alexandro-Nevsky Lavra monastery, and from 1737 it was in the church of the Nativity of the Mother of God on Nevsky Prospekt. In 1811, before the Fatherland War, the holy icon of the Heavenly Mediatrix was transferred into the newly constructed Kazan cathedral. In 1812 the Kazan Icon of the Mother of God provided blessing for Russian soldiers in repulsing the French invasion. On the feast of the Kazan Icon, 22 October 1812, Russian detachments under the command of Miloradovich and Platov destroyed the Davu rearguard. This was the first outstanding blow against the French after their departure from Moscow, and in which the enemy lost seven thousand men. And on this day snow fell, bitter frosts began, and the army that had subdued Europe began to falter. Numerous wonderworking copies of the Kazan Icon in Rus' glorify the All-Pure Mother of God, Protectress of the Orthodox Russian people. Of the plethora of icons of the Mother of God venerated in the Russian Orthodox Church, none is more widespread in number than the Kazan Icon. For all Orthodox Rus' it is esteemed as holy, and to it oftenest of all do they turn their gaze in misfortunes and illnesses, crying out: "O fervent Mediatrix, Mother of the Lord MostHigh, for all pray Thine Son Christ our God... with everything grant benefit and save all, O Virgin Birthgiver of God, and be Thou the Divine protection for Thine servant". With blessings of grace are dispersed icons of the All-Pure Mother of God throughout the extent of the Russian land, truly imaging the Heavenly protection, with Her constant intercession sent down by Her Divine Son, having offered Himself in sacrifice for the salvation of mankind. The ancient Vladimir holy Image of the Mother of God preserves and blesses the Northern bounds, the Smolensk and Pochaev Icons guard the West, and in the East, to the ends of the land shine the rays of the inexhaustible grace of the wonderworking Kazan Image of our All-Pure Mother.